In his inaugural address on January 10, 2002, Enrique Bolaños, the third democratically elected president of Nicaragua, announced the dawn of a new era for his country. With a rise in foreign investment, which grew by a remarkable 43 percent in 2004, Bolaños said Nicaragua was well on its way to recovering from poverty, corruption, and the civil war that once plagued its people. “Nowadays, private businessmen are investing in Nicaragua after twenty years of reticence and lack of confidence in the country,” he said. 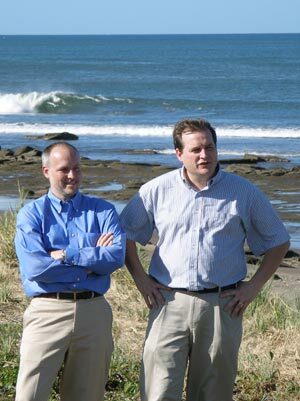 Bola�os was referring to entrepreneurs like Mike Cobb ’86 and Joel Nagel ’86, who joined forces in 2000 to develop Gran Pacifica, an up-and-coming resort community in Nicaragua’s Villa del Carmen County, forty-five minutes from the city of Managua. Cobb and Nagel met on Nagel’s first day at Allegheny and have been best friends ever since. “We had an intellectual connection first that became a deep connection,” Cobb says. That same day, Nagel also met his future wife, Susan Entress ’86. Cobb and Nagel majored in political science at the College, joined the Theta Chi fraternity, and were roommates. “The friendship we formed at Allegheny gave us a lasting basis for working together years later as business partners,” Nagel says. They parted ways after graduating, but neither could have anticipated how their paths would cross again. Nagel, a Fulbright Scholar sponsored by Allegheny, studied international law in Germany before opening his own law practice in Sewickley, Pennsylvania, where he lives with his wife and seven children. As past president of the Pittsburgh Rotary Club, Nagel made his first trip to Nicaragua on a trade mission in 1993. Cobb, meanwhile, was successful in the computer business, joining Comtech’s sales team in Springfield, Virginia, where he worked for eleven years. He and Nagel stayed in touch, he says, and soon “decided that it was time to branch out and do something on our own.” Together, they owned and operated a hotel in Belize and a teak plantation in Panama. Inspired by a tourism initiative launched by Nicaragua in 1998, Cobb and Nagel acquired 2,700 acres of land, including 3.5 miles of beachfront property on Nicaragua’s Pacific Coast, for only $1,000 an acre. Today, Cobb and Nagel are joined in their venture by about 120 investors, 25 percent of whom are from the Pittsburgh area, and are currently overseeing the rise of Gran Pacifica’s infrastructure. Working closely with President Bolaños, Cobb and Nagel fashioned a law in Nicaragua to enable Tax Increment Financing (TIF), which funnels the future property tax value of a real estate project into a bond used for financing current expenses, like construction costs. Cobb, the president of Gran Pacifica, and Nagel, the chief financial officer, expect the resort to develop over the next ten to fifteen years. Cobb even moved from West Virginia to Managua in 2002 with his wife, Carol, and their two daughters to supervise the project. “I’m fulfilling my calling in Nicaragua by helping others in significant ways,” he says. Gran Pacifica has already created jobs for two hundred Nicaraguans with the recent groundbreaking of its first 18-hole golf course (of 45 holes), and Cobb and Nagel expect to provide as many as 2,000 jobs as the resort progresses. In light of the region’s 30 percent underemployment rate, Nagel says Gran Pacifica will make a significant impact on the economy. He describes the resort as appealing to “snowbirds, baby boomers, and retirees looking for a very affordable and surprisingly upscale quality of life”-whether they choose to vacation at the proposed five-star Marriott hotel, purchase property and build a home under the resort’s two-year build requirement, or live in a neighborhood of Spanish Colonial style houses, condominiums, or casitas. The resort will also feature a town center of shops, restaurants, and other amenities. Cobb and Nagel have already witnessed the fruits of their labor, selling over 100 lots-with prices ranging anywhere from $30,000 to $300,000. They have enlisted Urban Design Associates, the land planning firm responsible for Walt Disney’s Celebration community in Florida, to create a sense of unity while also sustaining Nicaragua’s unique history and culture.